This year our son’s school requested for peaceful costumes of someone from history that made a difference in our lives. He has shown a lot of interest in rocket ships and space lately so he chose to be an astronaut. 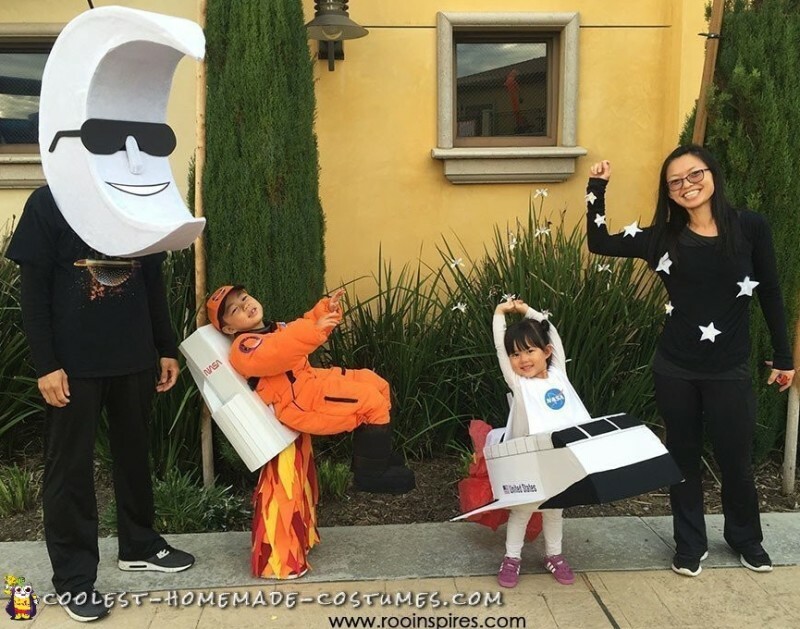 Our space themed family costumes revolve around his love for space. Most of the materials used we had around the house like cardboard, duct tape, hot glue and fabric. The only big item we purchased was our son’s space suit found on sale. The astronaut illusion costume was the trickiest to construct. We looked for tutorials online but had little luck. Many of them were for bigger/stronger kids or adults. We also had to make something light enough for my 6yr old son to wear – mutiple times. Due to this, his costume took 15hrs to make and cost $29 in materials. 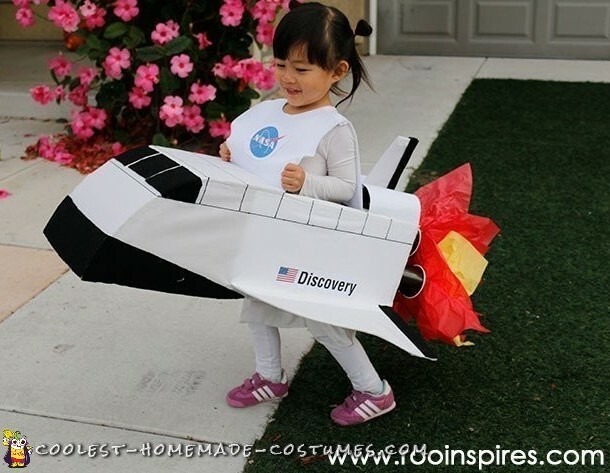 My daughter’s space shuttle costume was made mostly from cardboard and fabric. She is only 3yrs old so this costume had to be very easy to put on and off and stay on while out and about. Mission accomplished. Her costume took 5hrs and $5 to make. 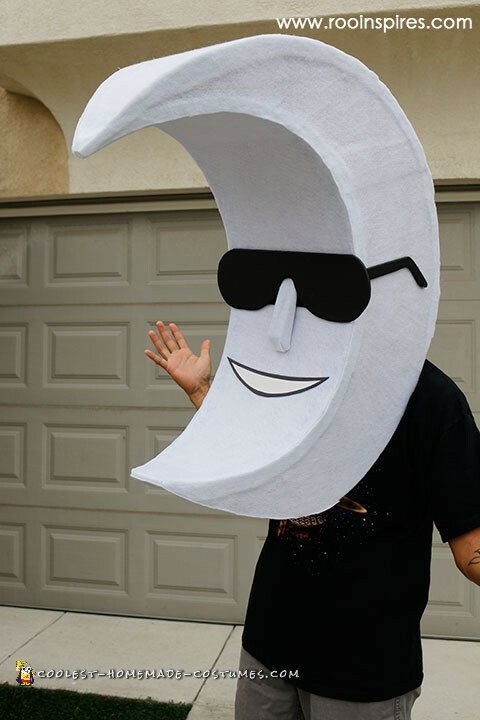 My husband had a hard time deciding what to be until he remembered this over-sized moon head from an old McDonald’s campaign featuring Mac Tonight – a guy with a huge moon head. In order to make his costume we used cardboard, hot glue, duct tape, felt and foam. Cardboard was cut and hot glued/duct taped to form the shape of the moon. The bottom is left hollow. Then, the entire moon is covered with felt fabric. A small hole is cut behind the sunglasses to see out of. Sunglasses, nose, mouth are made using foam core. 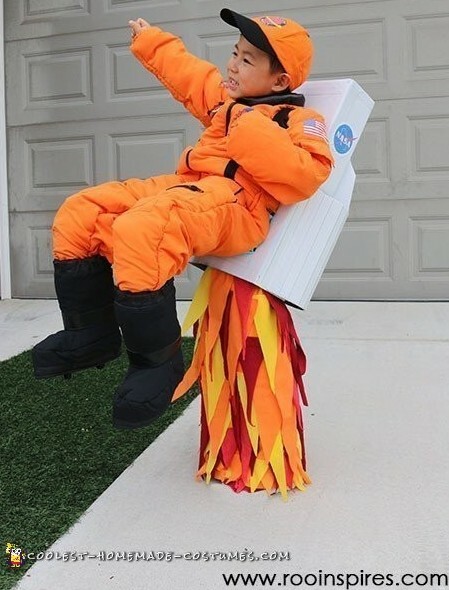 It’s hard not to crack up laughing at his costume – I love it! This costume took 8 hrs and $5 to make. 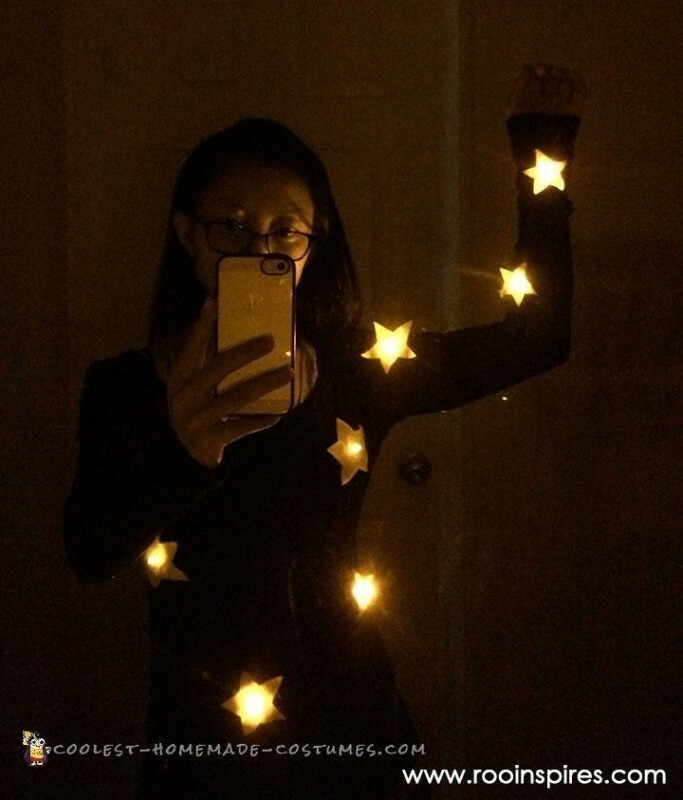 My costume is the Big Dipper constellation. It was the easiest to make of all four costumes. It took 3hrs and cost $0! I used an old black shirt, scrap fabric and borrowed LED tea lights. I love that it’s simple during the day but looks amazing at night. Finally, after 21 hrs of cutting, gluing (getting burned), taping, engineering and constructing we had our family space themed costumes completed. We looked for tutorials on how to make these but had little luck. So, after making these family costumes, we documented the tutorial for each homemade costume here on our website. We are thrilled to be sharing it with the maker community.